Located a few miles south of Downtown Los Angeles, Masjid Bilal Islamic Center has a rich history and tradition that spans more than half a century. Formerly called Muhammad's Temple of Islam #27 and located at 5606 Broadway, the community has played an essential role in the growth of Muslims throughout the Southern California area. In 1971, Abdul-Karim Hasan was selected to lead the Muslim community. Under his leadership, they would purchase their current property in May of 1973, which would help shape the dynamics for Islamic growth in the city. During the '70s, Allah blessed Masjid Bilal's propagation efforts, which reached tens of thousands of Americans, including prominent city officials and some of the world's best-known celebrities, who attended our events. In 1974, Abdul Karim Hasan helped establish the State of California's first Muslim Prison Ministry program, becoming an official advisor to the Director of the California Department of Corrections, and was the first Muslim member of the State Advisory Committee for institutional religion (S.A.C.I.R.). During the 1980s, our building was demolished due to earthquake damage. That would begin our quest to rebuild a new religious, educational and business complex. The City of Los Angeles Department of Building and Safety approved a three-phase plan in 1999. Phase one was to build a state of the art educational facility. Construction would begin in 2000, and the Bilal Learning Center would take nearly 7 years to complete. The sixteen-classroom school building was completed in 2007, with the help of Saudi Arabia businessmen and women, Grants from the Islamic Development Bank of Saudi Arabia, Sheik Hajj Muhammad Dakhil and Family, Sister Dalal Muhtadi and Bilal Islamic Center members. 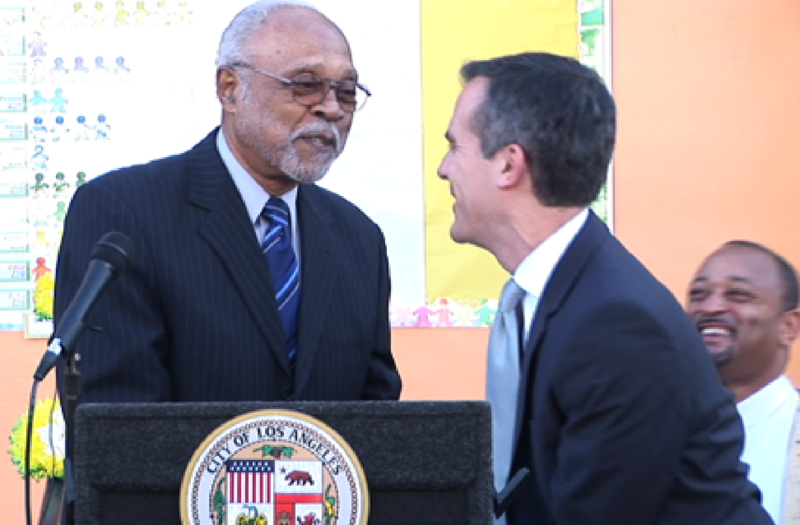 The Bilal Learning Center building has become a bright beacon of light for the city of Los Angeles. It is now home for the Center for Advanced Learning (CAL), a public charter school that educates more than 300 students from the surrounding community grades Kindergarten through 5th. The school has become highly successful and a leading model for communities throughout Southern California. In 2007, former City Councilwoman Jan Perry, with the support of the Los Angeles City Council, officially designated the city block where Masjid Bilal is located, as Imam Abdul Karim Hasan Square. It is located at the intersection where Martin Luther King Blvd crosses Central Ave. In 2013, Los Angeles Mayor Eric Garcetti (shown above) made a special visit to see Bilal Learning Center and praised the school's efforts. Last year, the Los Angeles Board of Supervisors honored Imam Abdul Karim Hasan, along with Najee Ali, Hussam Ayloush, May-May Ali, and the Umar Clinic, at City Hall, during the inaugural celebration of Muslim Heritage Month in Los Angeles. Today, Masjid Bilal Islamic Center continues to serve South Los Angeles through dedicated community outreach that encourages trust and understanding with our fellow Angelinos. The Masjid Bilal Islamic Center is currently initiating a fund-raising drive to complete phase two of our plan, which is the construction of a new Masjid center. On August 1, 2016, Asad Khan, President of Langdon-Wilson International Architectural and Design Firm, submitted final design plans for the new complex to the Los Angeles Department of Building and Safety.